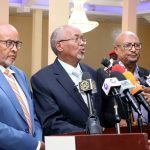 Somaliland president advisor on security affairs Mr.Ali Mohammed Waran’ade has confirmed that the new foreigner appointed to become Somalia’s Central Bank head is a threat to Somaliland determination of self-governance. He went on to reveal that all Horn of Africa countries should be on high alert to ward off the influence of this new comer. 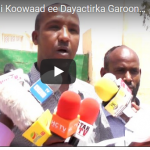 The former Somaliland internal security minister said this during an interview with a local Somali vernacular daily Geeska Afrika on telephone from India. He urged Somalia administered regions to also be on their guard as this foreigner has other motives. He added that Somaliland is a peace loving nation but will not tolerate violation of her territorial integrity and sovereign border.